Do you use strainers on a daily and regular basis? Running a restaurant or catering business? Or maybe you are just a serious cook that wants a serious strainer? GET A COMMERCIAL GRADE STRAINER WHEN YOU NEED IT! 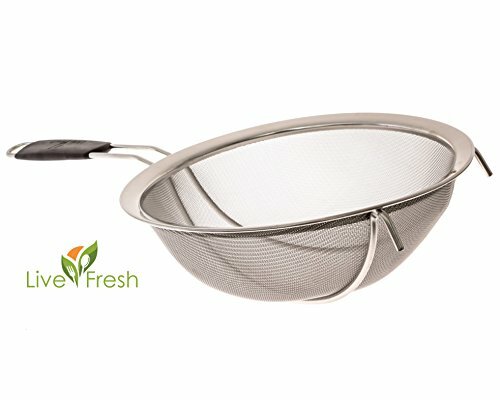 Our 9-inch/23 cm fine mesh strainer with reinforced frame design is ideal for any applications where you need a heavy duty strainer to sift and filter flour, ground oatmeal, salt, sugar, cocoa powder, coffee beans, confectioner's icing, lumps, soup stocks, or smoothies...the list is endless! STRAIN QUINOA, RICE, & AMARANTH WITH NO WASTE! Stop watching your food go down the drain! Our very fine wire mesh strainer is designed to strain the smallest ingredients, such as small grains, orzo, couscous, and farina. Guaranteed to never lose a grain or get your money back! Get a better grip! Straining a pot of noodles from boiling water is dangerous and you need the protection of our heat resistant good grip handles. The durable rubberized black non-slip handles protect your hands from the hot metal and provide the easy-to-hold grip that you need in wet, slippery conditions. With its specialize resting hooks and handle, you can also rest the strainer on a pot or mixing bowl so that you can free up your hands to hold that full pot of spaghetti. OUR LIFETIME WARRANTY MEANS THAT YOU NEVER SHOP FOR A STRAINER AGAIN! Make this the last strainer you'll ever buy! Our premium. corrosion-resistant stainless steel strainers are sturdy and engineered to last a lifetime with unmatched strength and durability. All materials are FDA tested, BPA free and approved for your safety. We stand by our product with a No-Risk 100% Manufacturer's Money-back Guarantee. Click "Add To Cart" Now And Never Need to Buy Another Strainer Again! ➤ NO MORE LOST FOOD DOWN THE DRAIN - Never waste another grain with our innovative fine wire mesh that easily strains the smallest ingredients with no waste. With a 9" / 23 cm diameter, it's the toughest and most durable strainer available in the market. It's excellent for filtering, sifting and straining vegetables, tea, coffee, fruit, noodles, rice, and flour...anything you want! If you have any questions about this product by LiveFresh, contact us by completing and submitting the form below. If you are looking for a specif part number, please include it with your message.